Spec[tac]ular Focus | Flickr - Photo Sharing! 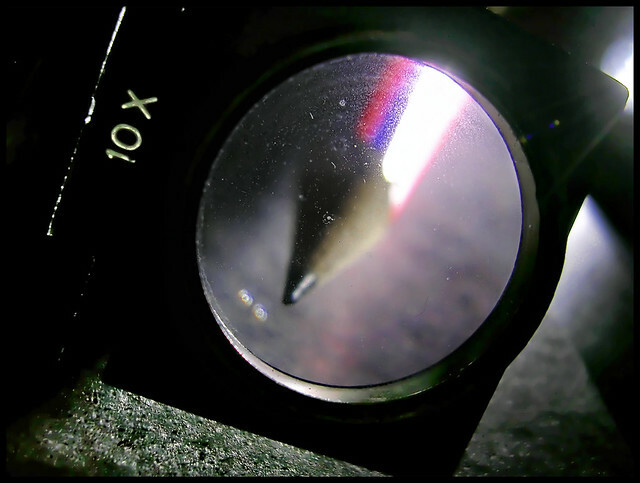 A different angle on the same pencil and loupe. I had to really fiddle with the histogram to make this one work, and I may have played too much. But I liked the murky shine on the pencil too much to let this one die away in obscurity. I have a 3M PostIt note upon which I scribbled inky blackness with a Sharpie (I'm all about trade-names!). This little 3x3-inch square of night became the background for a couple experiments. I like it because it's dark, yet textured, and flat. And tiny.